Flowering spring bulbs bring color, vibrancy and life to the garden, so what better Christmas gift for your nearest and dearest than a bowl of these beautiful blooms – or why not treat yourself? Three of the most popular spring bulbs for growing during the winter are hyacinths, paperwhite narcissi, and amaryllis. Kept indoors they will come into flower weeks ahead of those grown outdoors, cheating the seasons and bringing a guaranteed smile to anyone’s face. Few people can resist the sweet, heady scent of a hyacinth in full bloom. Grown indoors its floral aroma quickly fills a room, permeating the air with irresistible fragrance. Available in a range of colours, including white, blues, pinks and yellow, hyacinths are exceptionally easy to grow. Look for specially prepared bulbs that have been pre-chilled to trick the bulbs into thinking winter is already past. Plant the bulbs in containers or special hyacinth jars – they can grow in any planting medium, whether standard potting soil, wet gravel or even water on its own. Hyacinth jars have an hourglass shape. Its pinched-in waist supports the bulb just above the water sitting in the bottom half of the jar. Finished with a bow this simple gift promises to pack a powerful punch of color and scent. Prepare your gift by pouring in water up to the jar’s waist. Now position the bulb so its base sits a fraction above the water below. In this way the bulb has access to moisture without any risk of it rotting. The water will occasionally need to be topped up to stay at this level. Pop the jar into a cool, dark place – a refrigerator, cellar or unheated garage is ideal – and keep it there until roots appear and establish. This usually takes about three weeks, at which point the jar can be moved into a bright, airy room to encourage the flowers to develop. Alternatively, arrange bulbs in shallow bowls or dishes filled with gravel, pebbles or anything else that holds the bulbs upright. Plant them close together so that they sit side by side without touching. Fill the bowl with water to the base of the bulbs then finish off with a decorative dressing of floral marbles, coloured stone chippings, bark or any other loose material of your choice. Paperwhite narcissi are equally easy to grow. 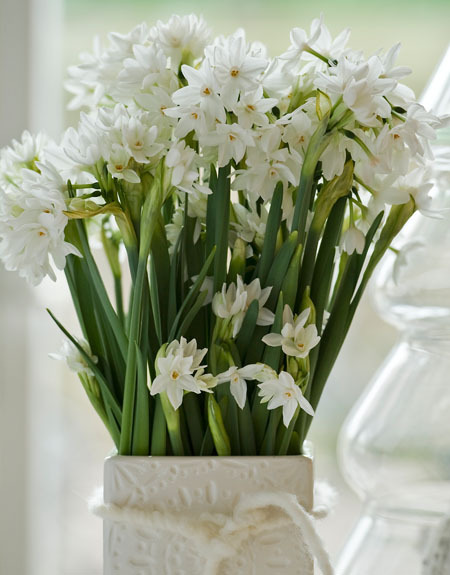 Each bulb produces two to three stems of brilliant-white flowers that create a decadent yet sophisticated arrangement. Bulbs sold for indoor growing don’t require a chilling period and will flower within a matter of weeks, making them ideal last-minute gifts for green-fingered loved ones. Just like hyacinths, potting soil isn’t essential when growing paperwhites. Try planting the bulbs in a clear vase filled with colored glass beads, or fill urns or planters with beads or gravel. Nestle the bulbs in position so that one third to a half of each bulb is still visible. Don’t be afraid to pack them in; this way you’ll guarantee a display with real impact. Fill the bowl with water so that the base of the bulbs only just touch the water. Once the roots appear you can drop the water level so it isn’t touching the bulbs. The lanky flower stems can be top-heavy, causing them to flop over. Encourage shorter, sturdier stems by watering your bulbs with an alcohol solution once they have established their roots, usually within a week of planting. Mix one-part vodka or gin to seven parts water. Drain off the water and replace with the mildly alcoholic solution. The alcohol makes it harder for the bulbs to take up water – the result is less foliage and stem growth, while the quality and quantity of flowers remains unaffected. Also known by their botanical name Hippeastrum, the amaryllis is the last word in bold and brazen beauty. It is the traditional bulb for Christmas giving, with its larger-than-life trumpet blooms in many colors. No one receiving an amaryllis will be left disappointed! Plant the chunky bulbs individually in containers slightly wider than the bulb. Amaryllises need soil to support their roots. Fill the pot with damp potting soil then sit the bulb on top. Now fill in around the bulb to leave a third of it exposed. You can hide the bulb if you prefer; moss, bark chippings or pinecones give a lovely natural look. The thick flower stalks don’t take long to appear, with blooms following on just four to six weeks from planting. Accessorize potted amaryllises by adding a luxurious bow, cut winter stems of dogwood or willow, or by planting the bulb with foliage plants such as English ivy and ferns for added interest. Keep the bulbs lightly moist while they settle in, then water more regularly as they start to grow – once a week is about right. Amaryllis thrive at a warm room temperature of 70 degrees Fahrenheit or 21 degrees Celsius, but can be moved into a cooler room to prolong the life of the blooms. Give flowering bulbs this holiday season and you’ll be sharing the gift of springtime. If you’ve got any other ideas for flower bulb combinations we’d love to hear about them – just drop us a comment below.